What is the Linksys Smart Wi-Fi Router, E4200? The Linksys Smart Wi-Fi Router, E4200 lets you access the Internet through wired and wireless connection. With the built-in Storage Link, you can easily add Gigabytes of storage space onto your network using USB 2.0 hard drives, or plug in a USB flash disk to access your portable data files. The Linksys Smart Wi-Fi Router, E4200's built-in media server streams music, video and photos from an attached storage device to any UPnP-compatible media adapter or player. • Network Address Translation (NAT) technology, which enhances network protection by allowing your computers to share Internet access through a single, public Internet IP address. Setup and use of the router is easy using Linksys Connect, the software that is installed when you run the included CD. Advanced configuration of the router is available through the provided web-based setup page. For more wireless bandwidth, the router can create two (2) simultaneous yet separate Wireless-N networks, one using the 5 GHz radio frequency band and one using the 2.4 GHz band. For example, you may use the Wireless-N 2.4 GHz network to surf, email, and print while keeping the less crowded, Wireless-N 5 GHz network free for time-sensitive traffic like Voice over IP (VoIP) calls, online gaming, and high-definition video. The Guest Access feature allows you to provide Internet access to guests visiting your home without granting them access to your local network. NOTE: For more details about this product, visit the E4200 product page to browse for more troubleshooting articles, downloadable user guides or firmware updates and other support information. IMPORTANT: In case the indicator light does not flash like any of the behavior stated above, you need to observe your connection first. If the connection works fine, that unusual activity of the indicator light only pertains to an active network connection; however, if you start experiencing intermittent to no connection, you may need to powercycle your router for a minute or two (2). If that does not fix the problem, you might need to update the firmware and reconfigure the settings of the router. To learn how, click here. Using an Ethernet cable, the Internet port connects the router to your Internet connection, which is typically a Cable or Digital Subscriber Line (DSL) modem. The yellow light flashes to indicate network activity over that port. The green light turns ON when the Internet port is connected to a 10/100/1000 port. If you have client devices, such as wireless printers, that support Wi-Fi Protected Setup™, you can press the WPS button to automatically configure wireless security for your wireless network. To know how to connect devices using the WPS feature, click here. The USB port connects to a USB storage device. The USB 1.1 standard supports speeds up to 12 Mbps. The USB 2.0 standard supports speeds up to 480 Mbps. The Linksys Smart Wi-Fi Router, E4200 recognizes USB 3.0 devices however, it will force the device to run on 2.0 speeds. QUICK TIP: The Linksys Smart Wi-Fi Router, E4200 USB port supplies up to 1000 mA power on devices. It is also FAT32, NTFS, HFS+journaled and non-journaled capable for data storing formats. For a list of tested USB storage devices, click here. This button allows you to reset the router to its factory defaults. Press and hold the Reset button for approximately 10 seconds. This button is located between the USB and Power ports. As an alternative, you can restore the defaults from the Administration tab > Factory Defaults sub-tab in the router’s web-based setup page. The Power port connects to the included power adapter. NOTE: The Linksys Smart Wi-Fi Router, E4200 router’s serial number and MAC address can be found at the bottom panel. 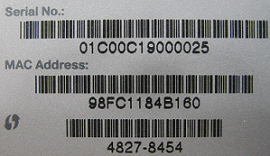 The Linksys Smart Wi-Fi Router, E4200’s serial number has 14 alphanumeric characters. • Bridge Mode - to learn how to set this up, click here. • Internet Protocol version 6 (IPv6) - to learn how to enable IPv6 feature on the router, click here. • Connection to a USB printer - for instructions on how to connect a USB printer to your router using Linksys Connect, click here. NOTE: For instructions on manually updating your router, click here.